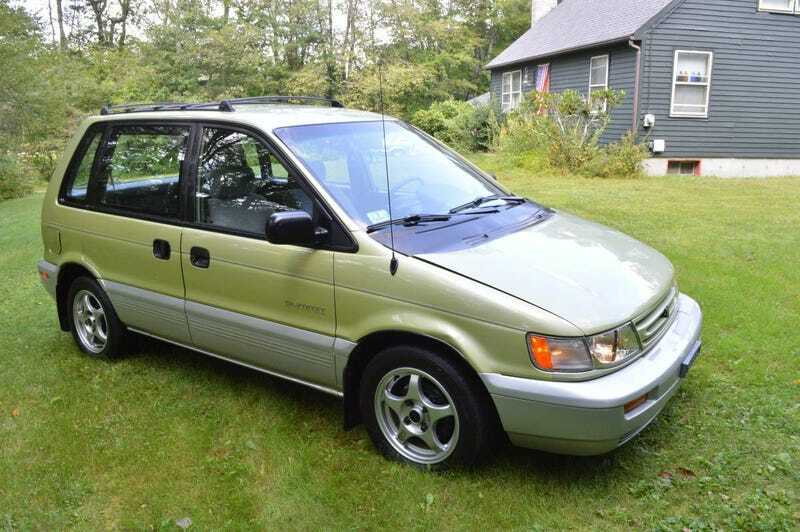 For $3,000, Is This 1995 Eagle Summit Worth Reaching? Built by Mitsubishi and sold by Chrysler’s now defunct Eagle brand, today’s Nice Price or Crack Pipe Summit wagon is an example of what was once called a “captive import.” Let’s see if this cute mini-MPV’s price makes it captivating today. What is it the say, “you gotta fake it ’til you make it?” Yesterday we had a 2006 Subaru Forester XT Limited that was a fake JDM STi wannabe, or as we say in polite company, a homage. Well, a lot of you said no to that ho and even more—72-percent in fact—felt its $16,000 asking price deserved a Crack Pipe loss. Maybe things would have turned out different if only the seller had listed the mileage. I guess we’ll never know. The ad for today’s 1995 Eagle Summit AWD wagon does list its mileage, which clocks in at a modest 93,000. The cute little car also isn’t trying to be anything other than the lean green (color) people pleasing machine its designers intended. It does come with three sets of wheels and tires so it lets its freak flag fly in the wheel arch department, albeit somewhat modestly. The Eagle Summit wagon was a version of Mitsubishi’s small “tall wagon” which was also sold in various markets as the Mitsubishi Expo RVR, Dodge/Plymouth Colt Wagon, and the Mitsubishi Space Runner which is obviously the best name. Here in Eagle guise it joined a United Nations conference of models that made up the Jeep-Eagle brand. The Taoist philosopher Lao Tzu once opined that the flame that burns twice as bright burns half as long, and while the Eagle marque didn’t burn into the public’s consciousness the way Chrysler had perhaps intended, its short run certainly seems to make this reference seem somehow pertinent. The Summit wagon was one of the funkier cars in the Eagle stable. Yes, its underpinnings were dull-as-dishwater Mirage-based, but the tall body with but a single sliding door on the right side for rear seat egress made that feel enthralling, and, dare I say it, somewhat dangerous. Now, I don’t know about you but vans and cars that lack a left-side rear door kind of freak me out. The current practice of minivans offering rear sliders for easy egress into access to traffic feels more normal to me, but that’s probably just because the design is now in the common parlance. This Summit wagon has both a swinging passenger door and a slider on the right, with just the driver’s door on the left. One of the intriguing decisions made on the car in light of this layout is the placement of the fuel filler on the slider side and not the other. That’s a great conversation starter for parties, so you’re welcome. Along with the easy access sliding door, this Summit offers five roomy seats and a decent amount of cargo capacity. The upholstery looks to be in fabulous shape as does the carpet and all the interior plastics. It’s all ‘90s generic cheap Japanese car in here, but there’s really nothing all that wrong with that. The exterior comes in the unimaginatively named “Greenish Yellow Metallic” over silver-painted bumpers and rocker cladding. The clear coat on the front bumper is peeling in large tracts, due to age. There are a few small dings and dents on the curb-side wheel arches, but the biggest body panel issue seems to be the hood. What’s going on with that hood? In several of the pictures the hood appears to be bowed in the middle as though it was once closed with a mechanic still leaning over the engine. The rest of the body looks straight and there’s no road rot to speak of evident in the pictures, but I’m still not over that hood. Maybe there was an accident in the car’s past? These wagons were as interesting mechanically as there were visually. Under that bowed hood resides Mitsubishi’s workhorse Sirius 4G63 four. That’s a 1.8-litre 16-valve engine good in this application for 113 horsepower. Backing that up is a three-speed automatic and AWD. You’ll want that automatic to free up your hands to return all the thumbs ups you get from appreciative Eagles fans thinking the car is about their team. The ad notes an exhaustive list of maintenance that has been undertaken in the last two years, and the inclusion of not one but three sets of wheels and tires. There’s a set of OZ alloys with all-season meats, 14-inch steelies with winter treads, and 17-inch Nissan Sentra SE-R wheels with summer tires because why the hell not. You also get a box of extra parts which is a nice bonus, as is a clean title. The whole ball of wax comes in at $3,000 which falls just outside of our unofficial if it’s running it’s a deal price range. What you need to do is decide if that three grand price makes this a Summit that’s worth the financial climb. What do you think, does $3,000 make this Eagle soar? Or, does that just make you want to flip it the bird? Worcester, MA Craigslist, or go here if the car disappears. H/T to Chris Rolt for the hookup!